If you’re going to a holiday gathering and looking for flowers to give as a host (or hostess) gift, we have some ideas for you. Any flowers would certainly be appropriate to offer someone having you over for a party, but there are a few blooms that we think will surely delight. Flowers are little luxuries that some people don’t think to pick up for themselves, so grab a bouquet of one of the following beauties and give some happiness this holiday season. We think it makes a dramatic statement of friendship during the holidays to offer a bouquet of all white flowers. Go with a singular bloom or a variety, just make them stunning. 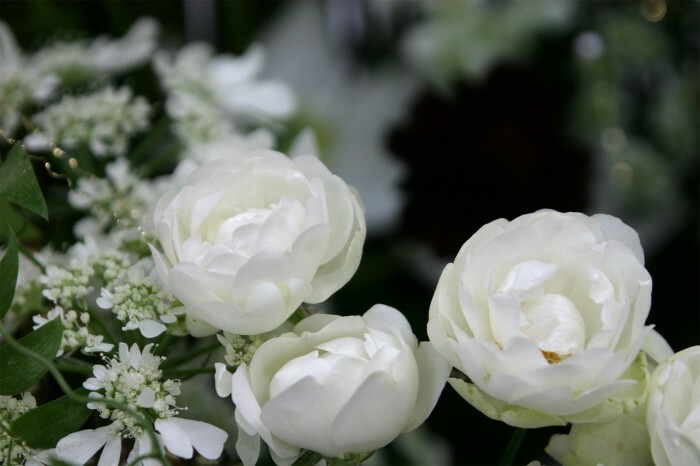 Choose any one or more of white cala lilies, Asiatic lilies, roses, anemone, and peonies. Add a bit of greenery to these winter white flowers, if you like. A stunning arrangement of spray roses and amaryllis, in white or red, makes a beautiful holiday host or hostess gift. You can opt for all white, all red, or a combination of the two festive colors. Consider choosing fun candy-striped amaryllis to make an impact. While red and white are traditional holiday hues, you don’t need to be traditional with the types of flowers you choose for a host or hostess gift. You can offer an unexpected arrangement of red peonies, red cosmos, red and white orchids, red black beauty roses, juniper berries, and pomegranate. All of these flowers, or combinations of flowers, will surely please your host or hostess. If you want even more ideas, you can always improvise and create something that’s truly your own, possibly by giving seasonal-colored freesia or green mini carnations. Ultimately, the best host or hostess gift will be something that you put your heart, and spirit, into. If you’re going to a holiday gathering and looking for flowers to give as a host (or hostess) gift, we have some ideas for you. Any flowers would certainly be appropriate to offer someone having you over for a party, but there are a few blooms that we think will surely delight.Flowers are little luxuries that some people don’t think to pick up for themselves, so grab a bouquet of one of the following beauties and give some happiness this holiday season.